The first thing that surprised me is Hazel. She was diagnosed with cancer when she was 13 and it’s a miracle that she is living today as a strong and admirable girl of sixteen years. Her no-nonsense and blunt way of thinking grabbed me and I instantly liked her. She is trying to make the best out of her situation, but I also liked her vulnerable side. It made her so real and honest. I appreciated her moments of a ‘normal’ teenager. She is rebellious against her parents and she feels smothered by their constant worrying. The way Green portrayed her family was fantastic. Her parents are so caring and protective, but they are still trying to give her a normal life. They share something special and it blew me away. Hazel and Augustus were made for each other. These two characters are an adorable couple and they make you believe in true love. They complete each other and I liked the way their feelings grew. The flirty dialogues are slowly transforming to a love everybody is looking for. I completely started to fall in love with Augustus together with Hazel. He is charming, humorous and sweet. It has been a long time since a book made me feel so many things and I finally understand why everybody is praising John Green. His words are poetic and they flow across the pages. Like I said on my Goodreads status: “You want to keep reading as fast as possible to see how it's going to end. But you also want to let it sink slowly, so you can enjoy his beautiful prose." I recommend this book to everyone. I’m not such a fan of most contemporary books, but this book opened my eyes. Just.. read it. "I honestly wanted to quote every page"
I already want to re-read it, just to disappear between his beautiful prose <3 His other books doesn't sound as appealing to me, but I might try one some day. I was liking the book but then I got totally bored with what was going on with this writer who doesn't reply to anyone but replied to them. I think Green was trying very hard to play my emotions and make me feel sorry for the characters. That was a bit strange, I agree :) But the other characters totally made up for it, in my eyes. Wow, great review Mel. It really makes me want to read this book. I've been keeping it off, cause I thought it would be to emotional.. but now I am actually looking forward to it! I was scared of that too, but it's so worth it. I still haven't read this yet - I've read a couple of other John Green books and enjoyed them, and I know this one comes highly recommended by so many people, so I should probably just dive in and read it - tears pr not! I have read nothing but good reviews of this book! I need to check it out finally! Great review. I totally agree with you, especially about Green's poetic writing and how you wanted to read it fast and slow. If heard they've started casting to make it into a movie. Ohh, that is interesting! I'm going to check google to find out more about the movie. Aw, I loved this book so much. I can't wait to see the movie! But, I hope you are going to read it soon Megan! I can't wait to hear what you think about it. Ah Mel this is a brilliant review *stands on island alone as the last person on earth who hasn't read a Green book* I really need to try this one, your review has me so curious! Aaahh, FANTASTIC review, Mel!! I actually haven't read this one yet (for shame!) but I am so happy to hear that this one gave you ALL THE FEELS. Gah, I'll have to read this one soon hopefully and I'll have to prepare myself for the read of a lifetime!! I haven't read this yet either but I read a few pages before I bought it and was like, "I HAVE TO OWN THIS." Definitely excited, I love books that rip you up emotionally. Convincing review! :) Thanks for stopping by my blog! I want to read this book so bad but I know it's going to hurt so much :( I just need to gather the courage and buy it because it sounds so beautiful and amazing. I'm so glad you liked this one, Mel! I read this when it came out early last year, and I was really impressed with Green's emotional depth, at the time. I think he's done a pretty good job in writing teenage characters that all ages can enjoy and empathize with. I agree! It really felt like the story of two teenagers. I definitely want to get a copy of this book asap. I've heard so many amazing things about it, and I really want to give it a try now. I'm just worried that I'll cry a lot :( The quotes are great, though. Awesome review! Fab review Mel- I loved this book, so emotional. And I liked the quotes you picked. This is a beautiful review, Mel! And now... I'm conflicted again! ;) I honestly have no idea which John Green book to start with, though it looks like this one has touched quite a few people. I tend to avoid books about cancer, but this one sounds like it is worth it. Great review! It's one of the most beautifully written books I've ever read. I still think about it a lot! But I'm dying to know what all the fuss is about and I've been wanting to try something by John Green, I've heard such great things about his books! WH-HEY! You've read it! I was so excited when I saw this review and I'm absolutely THRILLED TO BITS that you loved it so much. One of the things I really liked was Hazel's family, because they were awesome and I agree that parents are so often just not awesome and having that is so wonderful. It made the book so much more. I can't get over how beautiful John Green's writing is, either, and basically wanted to quote the entire book, it's so beautiful. I love that you chose quotes to post that aren't the more regular ones, these are especially beautiful. Incredibly beautiful and fantastic review, Mel! Yeah, I decided that I wanted two different quotes. I'm happy you liked my picks :)! I'm glad you like it as I ADORE this book :0 So good! Yay! I'm so glad you loved this one just like I did. I'm not a big contemporary reader either, but these characters are brilliant and the prose is just amazing. So many quotable passages.... It's really a book that will stay with me forever. :) Nice review! I agree, it's a book I think about often. I'm a little speechless after your review, because it reminded me of how I completely and utterly LOVED this book, and how beautiful it was in every single way. But I am so, so happy you loved it, Mel!!! Especially because you're not a big contemp fan ;) And “I fell in love the way you fall asleep: slowly, and then all at once.” is my favorite quote, with the ones you mentioned at the bottom following closely after :) This book. I can't even. I know. It's.. impossible to explain this book. There are no words to describe it's beauty. 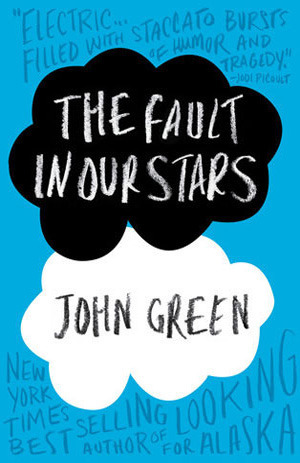 Another amazing book by John Green. I never really had a favorite author before but after reading Looking For Alaska, tbh he'll always be on top of the list. and when this book came out on 10th Jan this year (Flipkart, i wish we could pre-order it)i H A D T O read it. even though i really liked the book, but i think Looking For Alaska was 10% better, but nonetheless, it's a good book you can't miss it!